Hi, Clay and Susan! I have to say, your books sounds really fascinating. I have a thing for the Victorian era and the possibilites of steam punk. I've enjoyed steampunk movies very much, but am just venturing into steampunk books. I plan to start with yours and probably Scott Westerfeld's "Leviathan" series. I'm intrigued by how you've woven so much into one series. It sound like your take on vampires is very new and quite different. How did you decide what "rules" to create for your vampires? Were you influenced by any existing vampire mythologies? Hi, Clay and Susan--I love alternate history. I was a history major in school and am fascinated by speculation about what might have been had one little thing gone differently. I went to a couple of the alternate history panels at DragonCon. The steampunk costumes at the con were some of the most imaginative I've seen. Victorian England has never been my favorite period, but as I begin to look into steampunk, the era seems more appealing. Like Caren, I'm just beginning to get my feet wet in the subgenre. Your books sound like a lot of fun. I've just started reading steampunk and have loved the little I've read so far (most recently, Worldshaker by Richard Harland). Greyfriar looks fantastic. I'll definitely be getting it. Thank you for an interesting article. I like how you approach steampunk.I'm a reader who loves steampunk and the Victorian era and like you I'm not part of the community. It is great to see the increasing number of steampunk novels. Thanks for the comments, everyone. We hope you enjoy the book. Caren, our goal with our vampires was to start with elements of the traditional mythology and then come up with biological traits that might have been responsible for inspiring those myths in ancient times. 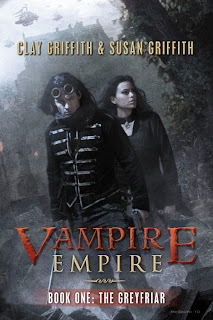 Our vampires' behavior has its roots in science, although given that the science in our world is slight altered 19th century science, there is much that is not understood or explained in ways that are different than in real history. Nancy, the steampunk presence at DragonCon was amazing. The creativity is stunning. Can't wait for next year to see it again.